Each artist could submit up to three pieces to the juried exhibit, so I decided to make a series of three paintings that would combine elements of some of my favorite textiles from different cultures. Normally, I work with acrylic paint and beads on canvas, stitching beads and fabrics onto my collaged pieces in order to pay homage to the laborious stitching of anonymous women of the past. Because of this special exhibit’s parameter of working on rigid wood panels, I couldn’t sew fabrics and beads onto my pieces, and I struggled to find a way to “collaborate” with these women by adding my own stitching. I began by painting collages of intricate traditional textile designs onto the wooden panels with acrylic paint, and I enhanced my designs with a few repurposed pieces of vintage textiles. At some point in the process it hit me that I could paint tiny “stitches” in the backgrounds of my designs, so I did–thousands of them! I’m excited by the way in which the three pieces blur fabric and paint; even closeup, it’s not easy to tell what is painted and what is a recycled piece of stitched fabric. For this reason, I am calling them my “trompe l’oeil” series. 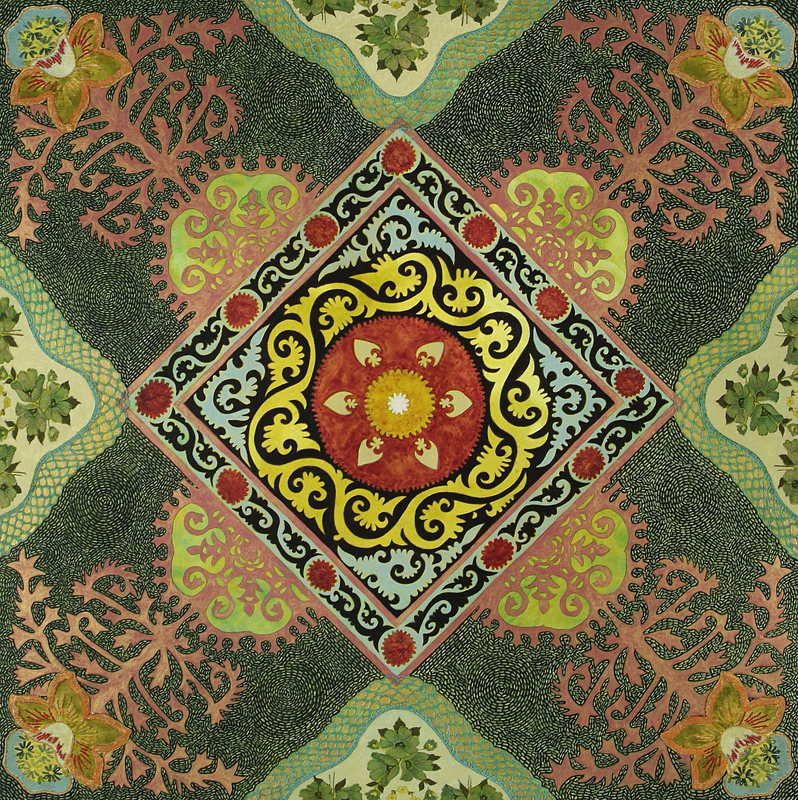 “Homage to Needlework: Trompe l’oeil #1” was inspired by the central medallion from an embroidered suzani from Uzbekistan. I love suzanis, which are embroidered tribal textiles traditionally made by central Asian brides for their weddings; they have a celebratory, energetic feel with their suns and vine motifs. I also drew on an antique Hawaiian quilt design, which radiates into the four corners and is enhanced with embroidered flowers from a vintage table runner. Lastly, I cut a vintage handkerchief with a border of hand-crocheted lace into four pieces and adhered it onto the canvas, painting the background a different color. The piece was harmonized and energized with the addition of hundreds of small painted “stitches.” This one may be my favorite; I love the complex color palette and the vibrating presence of the pale blue stitches on the deep forest green background. “Homage to Needlework: Trompe l’oeil #2” also pays homage to suzanis (“suzan” is the Persian word for needle) by featuring four “sun” motifs around a central painted medallion that was inspired by an antique Persian Kashmir shawl. I cut out four cross-stitched floral motifs from a vintage tablecloth that I found at a recent antique fair to enhance the centers of the painted suns, and I recycled cross-stitched rose motifs from a Victorian Dutch embroidered pillow cover for the four corners, painting them to harmonize with the background. The hardest part of the piece was painting the four pale pink doily motifs on each side of the painting; I had to use a very tiny brush. Even from a short distance it’s hard to tell that they aren’t actually real doilies. This piece also required the most tiny painted stitches for its background, and by the end my hand was very cramped! 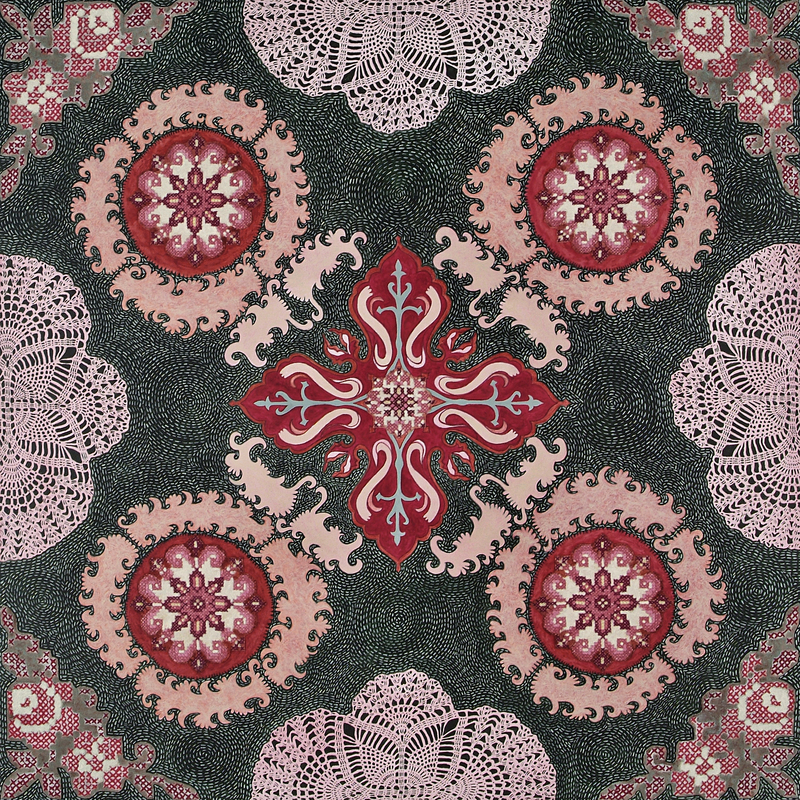 “Homage to Needlework: Trompe l’oeil #3” features a piece of beautiful lace that my mother-in-law brought me from Belgium for its central medallion. I cut out small pieces from it in order to paint a fern design in each of the six golden petals. The design is an African Adinkra symbol that stands for endurance and resourcefulness; I love both the interesting pattern and the meaning, which I feel is relevant to much of “woman’s work.” I also rescued four gorgeous embroidered silk flowers from a very old textile remnant; I adhered them onto the panel on the diagonal to lend a radiating energy to the piece. The “lace” butterflies in the corners are actually painted copies of a motif from an antique lace pillow cover that I purchased on eBay. 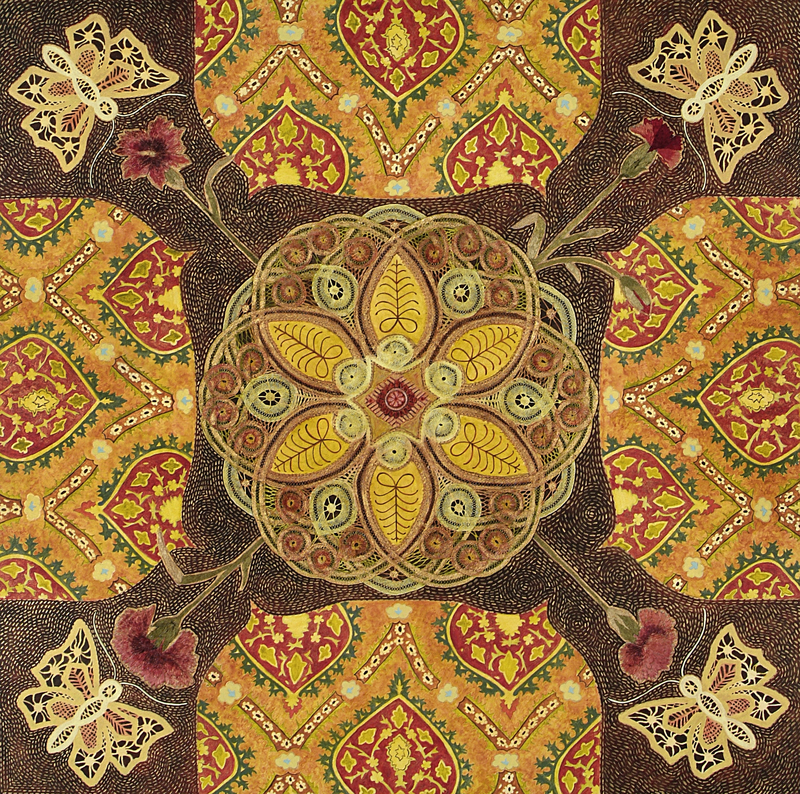 Once again, there is an intricate painted suzani pattern, which I adapted from a Turkish pillow and embellished with gold and many luminous washes of paint. This piece is the one that inspired me to incorporate the background “stitching;” once I saw what an interesting dimension it added, I used the technique in the other two, as well. Each piece ended up taking over 60 hours to execute–more than I had estimated–so the three paintings together took up the vast majority of my studio time for 2 1/2 months. I had hoped that one of the pieces would be accepted, so I was thrilled to learn yesterday that all three of them were juried into the exhibit! If you are in the Lake Oswego area, mark the weekend of June 21-23 on your calendar and come enjoy the festival–it’s always a fun and inspiring event!